Richly illustrated throughout, this comprehensive resource is designed to fully equip Trainee Nursing Associates for their future role as professional healthcare providers with chapters ranging from ‘how to learn’ and essay writing to communication skills, reflective practice, and the role of evidence-based clinical decision making. Basic anatomy and physiology, together with the care and treatment of common disorders, form the second part of the volume. 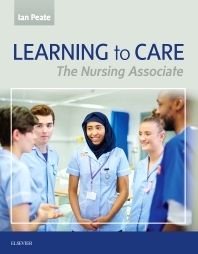 The book includes a wide range of learning features and comes with a downloadable image bank to assist trainee nursing associates with their assignments. Professor Ian Peate’s ability to produce scholarly publications and conduct high quality research, together with his ability to undertake and influence practice internationally, are renowned. The route of scholarly activity evident in his publications list has its genesis in the art and science of nursing with an emphasis on improving health and promoting social justice. Caring for people has become a prominent theme within his endeavors, embarked upon in response to a number of criticisms from within and without the nursing profession lamenting the perceived lack of caring in nursing curricula. This approach to explicitly stating or outlining the prominence of care and what this entails demonstrates his commitment to the provision of high quality care with a sound evidence base underpinning care delivery. Ian currently edits The British Journal of Nursing an appointment which, he says, allows him to contribute to establishing the tone and editorial direction of the journal with the overall aim of impacting on care delivery, and the education and preparation of nursing students. Ian has recently received the OBE for services to publishing and has just been awarded a Fellowship of the Royal College of Nursing.